Then, the Westside Observer carried a grayscale photograph of the Mount D turkey, submitted by Kay Curry [bottom of page 8]. And someone else said a lone male turkey had been seen hanging out on Potrero Hill. Meanwhile, it looks like there’s a new addition to San Francisco’s wildlife. 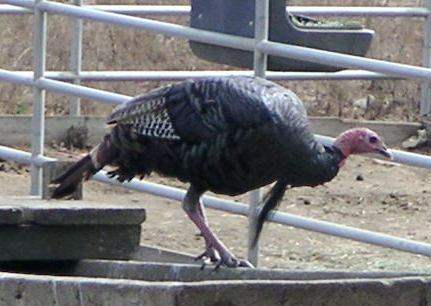 About 2 years ago sightings of wild turkey were rare in the Oakland hills (where I live). But now one sees them often, not only in the hills of Claremont canyon and Claremont Avenue but in the so-called “flats” of Domingo, College Avenue, and even in Rockridge. They are comical looking birds; often one sees them walking in pairs, close together, as if they are strolling along enjoying being together, chatting and gobbling away. I have seen as many as 6-8 wild turkeys crossing roads. When the first screen comes up, click on birds. There are some photos of turkeys close to the end of that collection.